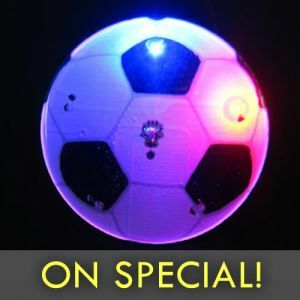 Check out our full range of exciting Lighted Flashing Pin Body Lights! 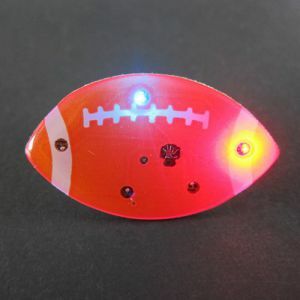 Including a wide variety of flashy blinking shapes, patriot flags and themed flashing pins! Instantly turn your LED pins into light up pendant necklaces with our Pendant Backer with Lanyard! Need your flashing pin custom printed? Call us at 1-877-233-GLOW(4569) and we can help you! 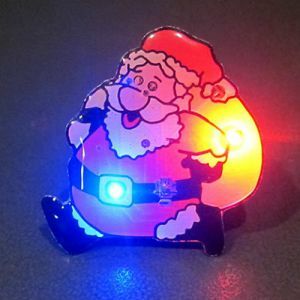 Celebrate at your special holiday party this year with Flashing Blinky Seasonal Shape Badges from GlowProducts.com! 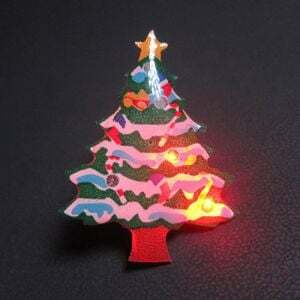 Light up a winter wonderland with Blinky Pin Christmas Tree Shapes! And guess who's coming down the chimney this year? It's fun Santa Claus Flashing Badges all lit up for Christmas! And our Red, White or Green Clip on Lights can be used in fun Christmas Crafts, Centerpieces and Light up Balloons or you can light yourself up like a Christmas Tree! We have the mini LED clip on lights available in both Steady Light Pins and Flashing Blinkies and there are lots of colors to choose from. This Halloween will be extra spooky and light filled with our creative Halloween Blinkies! 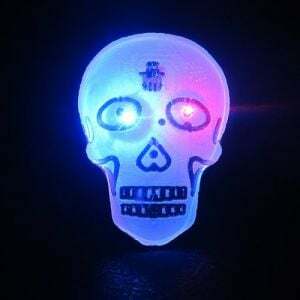 Fun Color Changing Skull Shape Body Lights will dare you not to have a good time. 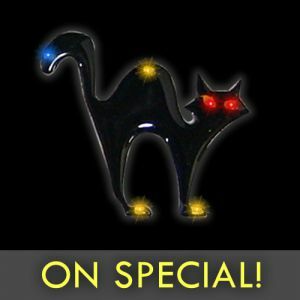 And our classic Black Cat Blinky Badges, Pumpkin Shape Light Up Pins and Flashing Black Bat Body Light Shapes are a must have this Halloween! 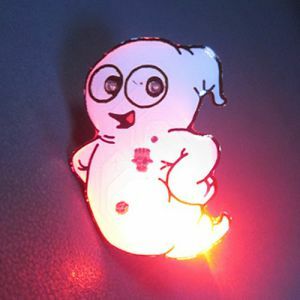 And if you don't want to get too scared, there's our Happy Ghost Blinky Pin, this happy ghost is sure to bring a smile to everyone's face this Halloween! If you have a school dance, fun Valentine's dinner or fun Valentine's Day Charity Event then we have the badge for you! 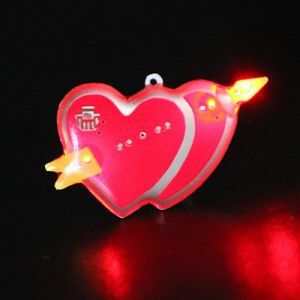 Tell cupid you're already taken with our Double Heart with Arrow Flashing Pin. Not sure your mood is right for love? 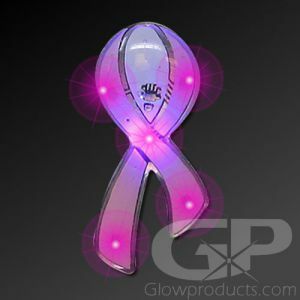 Then our Slow Color Changing Mood Heart body light is the one for you. 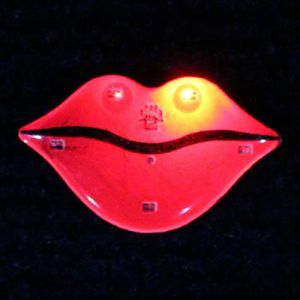 And if it's your turn to be in the kissing booth this year, it's time for some Hot Lips Flashing Badges! 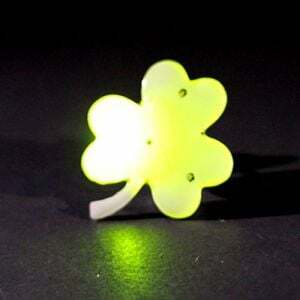 Get ready to light up the World's Funnest Holiday – St. Patrick's Day - with classic Light Up Shamrock Shape Flashing Blinky Pins! And we've got Beer Mug Flashing Pins and Martini Shape Body Lights too! Or just light yourself up with Flashing Green Clip on Lights or Green Steady Light Clip on Lights! Raise a pint and start singing, it's Oktoberfest time! With our Flashing Beer Mug Body Lights your Oktoberfest Party is sure to be a huge hit. Now go put on those polka albums! 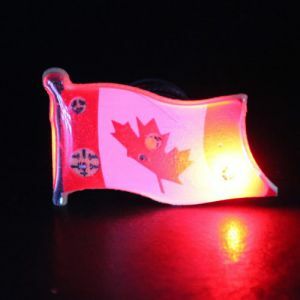 Bring on the fireworks and the Canadian Flag Flashing Blinky Pins and light up this July 1st celebration right! And we've got Red and White Clip on Lights too! Light up the Red White and Blue this Independence day with the American Flag Flashing Badges! 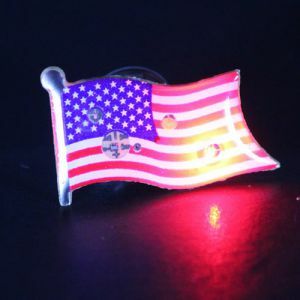 And we've got both Flashing Red, White or Blue Clip on Button Lights or Red, White or Blue Steady Light Clip on Button Lights to light up Fourth of July Party Decorations, Centerpieces, Crafts or just light up yourself! Have you got a special event or glow party coming up? Then chances are, we've got the Blinkies for you! 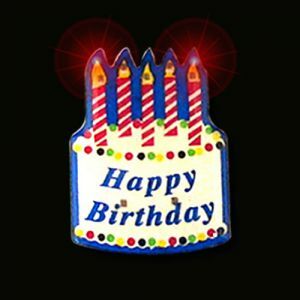 Get the Party started right with fun Birthday Flashing Pins! 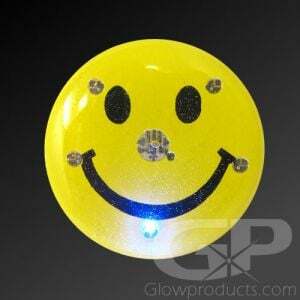 The classic Happy Face Flashers are always popular at glow parties, fairs and festivals. 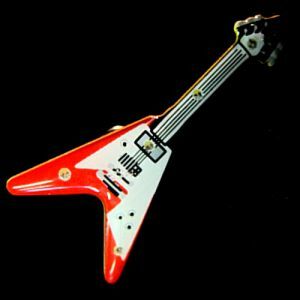 And if you have a rock themed birthday party or event coming up, check out our Electric Guitar Body Light or the Flying V Guitar Blinky Pin to really get things Rockin'. 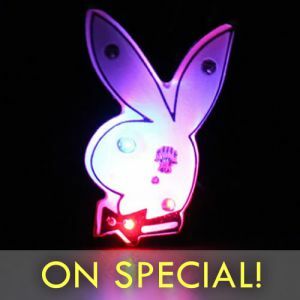 Play Boy Bunny Body Lights and Hot Lips Blinky Badges are great for fun Bachelorette Parties. 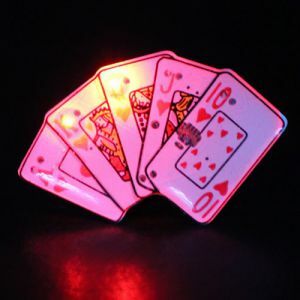 And if you have a fun casino party night that you need to organize, then you're going to need Royal Flush Flashing Pins. 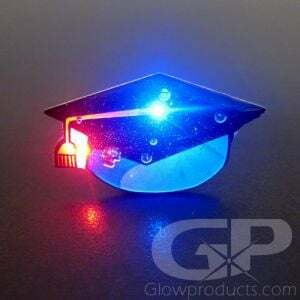 And for that epic graduation party, then it's time for Graduation Cap Light Up Badges! Need to raise some money? 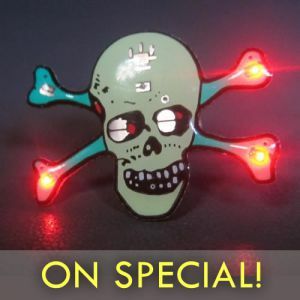 Sell Flashing Blinky Pins! Want to attract attention to your raffle prizes? Give out Flashing Pins with every ticket sold. Raise money and have fun at the same time at your next Charity Event, Gala Dinner or Fundraiser with Light Up Star Shape Flashers, Pink Ribbon Breast Cancer Awareness Blinky Badges, Heart Flashing Pins, Graduation Cap Body Lights, Light Up Fire Truck Pins, Police Car Flashing Badges, Color Changing Heart Shape Body Lights, Color Changing Star Shape Pins, Smiling Star Blinky Badges, Beer Mug Flashers, Cocktail Glass Body Lights, Light Up Royal Flush Pins. 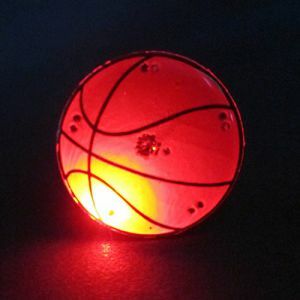 And if you have a big game coming up and need to raise money for your next road trip, check out the Light Up Football Flashers, Soccer ball Blinky Pins and Basketball Body Lights. So whether it's homecoming or a charity poker tournament, we've got the Blinky for you! This summer's festival season is going to be amazing! 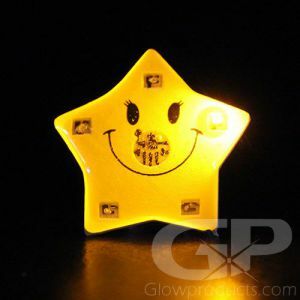 With so many festivals and fairs and you'll be able to light up them all with fun flashing blinky badge shapes! So if you're looking for light up Black Bats for the city of Austin's annual Bat Festival or fun Cowboy Boot Flashing Pins for the local rodeo we've got you covered! And for even more ideas check out the Smiling Star Flashing Pin, the Electric Guitar, Flying V Guitar, Play Boy Bunny, American Flag and Canadian Flag Flashers! One of the most versatile products that we carry. There seems to be no end to the amount of uses the mini clip on button lights can be put to. Not only can they be worn as fun light up clip on earrings, but they can also be clipped onto clothing and costumes to light yourself up! 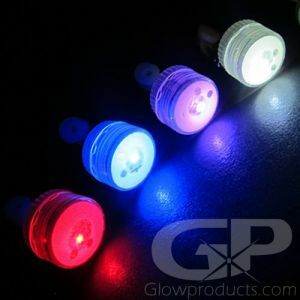 The mini LED clip on lights can also be used as balloon lights! Just turn on the LED clip on light and put in the balloon about to be blown up and you've got instant light up party balloons! The mini clip on lights are super fun to make light up crafts with, including light up Christmas Crafts – you can light up Christmas Wreaths and holiday decorations all over your home to make this Christmas extra special! Put them inside Easter Eggs for glowing Easter Egg Hunts! They're small enough to fit into centerpieces and hanging party decorations without being noticed and put out enough light to really make everything shine and sparkle with light! Available in both Flashing and Solid Steady Light, the LED mini clip button lights come with batteries already installed – just twist to turn them on. And the CR927 button cell batteries are easily replaceable. With a duration of 8 to 12 hours of continuous use, the mini LED clip on lights will last all night long! 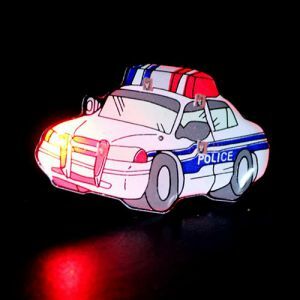 - How do Flashing Blinky Body Lights work and can the batteries be changed? All Blinky Badges use small battery operated LED Lights to light up and flash. Just remove the battery protector and then twist the flasher until it turns on. The batteries can be easily changed. Just unscrew the flashing pin and take out the two pieces of CR927 button cell batteries, replace and then screw the body light back together. The butterfly pin backer is also easy to use. Just squeeze the two clips together to release the protective backer from the pin. Attach the pin to your outfit and then replace the backer over the pin. A cool way to wear the body lights as a flashing necklace pendant is with our Body Light Pendant Backers! - Why don't the Body Lights come with magnets anymore? The Flashing Shape Pins used to come with powerful rare earth magnets that were used to hold the body lights in place on your clothes, or even as earrings. Unfortunately we can no longer bring in the body lights with a magnetic backer as Consumer Protection found them not to be child friendly. - Can I turn my Flashing Blinky Pin into a Flashing Pendant Necklace? Yes you can! 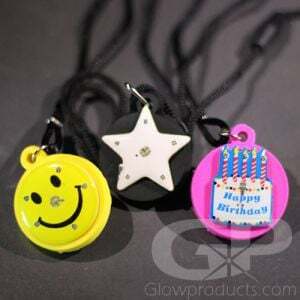 With our special Body Light Pendant Backer you can instantly turn your Flashing Pin into a Light Up Pendant Necklace! Just turn your flashing pin on and then insert into the middle of the pendant holder. The Body Light Pendant Backer comes complete with lanyard necklace! - How long do the Blinky Badges last? If you just turn it on and let it flash, your Flashing Pin will flash for approximately 18 hours continuously. If you turn it on and off, you should get approximately 24 to 30 hours of use from your light up badge before having to change the two pieces of CR927 batteries. Just unscrew the two halves of the body light to separate them, replace the two batteries and then screw the two sections back together – it's that easy to change the batteries. The batteries have a 1 to 2 year shelf life depending on storage conditions. 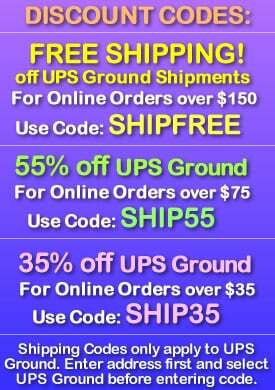 - Do you provide a discount for bulk ordering? Yes. 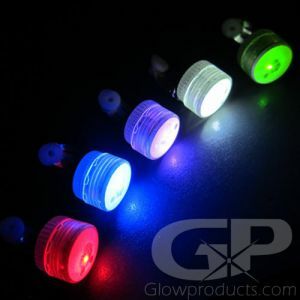 On each product page you will see quantity pricing listed, if you are looking for a quantity not displayed, contact us directly, toll-free at 1-877-233-GLOW (4569) about pricing for bulk Blinky Flashers Glowproducts.com will work with you to provide the best wholesale Flashing Badge pricing we can! 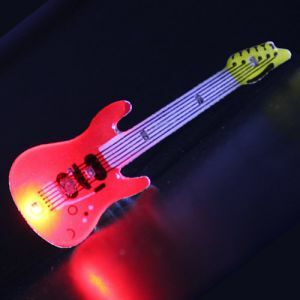 - Can the Flashing Blinky Body Lights be customized with a custom shape and logo? Yes they can. 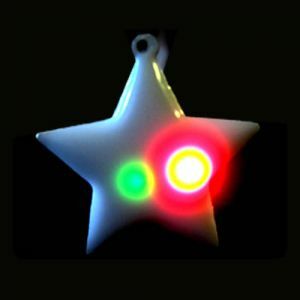 There are several generic shapes, like circles, rectangles, squares, ovals and stars that are available to put a custom logo on to, or you can have your own unique custom blinky shape created. 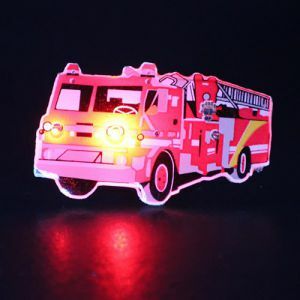 Just give us a call at 1-877-233-GLOW(4569) and we can let you know about the many custom options available with the custom printed flashing body lights!